An exciting new collaboration has recently begun between the Deree School of Graduate and Professional Education and the Greek NGO ELIZA-Society for the Prevention of Cruelty to Children, the Executive Director of which is our very own alumna Aphrodite Stathi. ELIZA is a non-profit organization that safeguards and promotes the rights of children who have suffered – or are in danger of suffering – abuse and neglect, specifically from the ages of 0 to 5. The non-profit organization implements high-impact awareness campaigns aimed at prevention, but also at combatting the lack of awareness and engagement of the general public. Deree has signed an MoU with ELIZA, whereby students from the MS in Counseling Psychology & Psychotherapy and the MA in Applied Educational Psychology will work alongside alumni and professors of the graduate programs, and participate as interns in an ongoing project for the prevention of sexual abuse in children. “Safe Touches” is a sexual abuse prevention curriculum designed by the New York Society for the Prevention of Cruelty to Children (NYSPCC), for children in kindergarten classes up to third grade. It is administered in NYC public schools since 2012 along with a parent training workshop on issues of child sexual abuse. It’s administration by ELIZA in Greek schools will be also focusing on the effectiveness of the program in greek students through the collection and analysis of research data. The adaptation of the program to the Greek culture, as well as its administration and evaluation, was made possible by the generous support of the Stavros Niarchos Foundation. Dr. Tinia Apergi, Program Coordinator of the MS in Counseling Psychology & Psychotherapy, is the principal investigator, Dr. Chrysanthi Nega, Assistant Head of the Psychology Department, is the senior research psychologist, and Dr. Eva Syngelaki, Part-Time Lecturer of Psychology, along with the alumnae Vasia Danaskou, Mental Health Counselor and Anna-Maria Economou Mental Health Counselor, will lead the intern teams in the program administration. 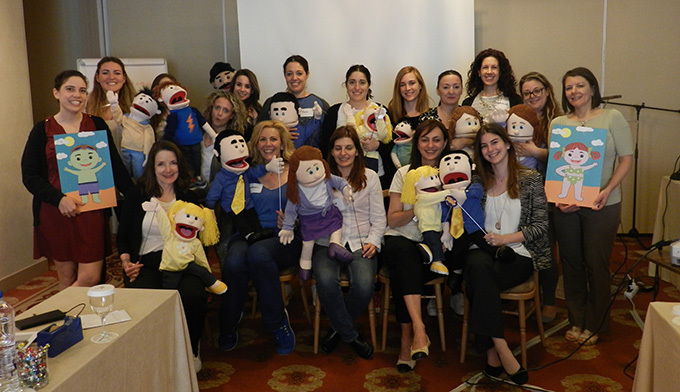 The first step of this initiative was taken on April 22 and 23 at Hotel Amalia, where 17 students, professors, and alumni took part in the “Safe Touches” Train the Trainer Workshop, designed by NYSPCC and ELIZA. Starting in June 2016 and following in the next academic year, the program will be distributed to several private and public school in the wider Athens area and in Crete. This new collaboration sets the foundation for meaningful initiatives that will offer valuable hands-on experience to our students but above all, will offer them the opportunity to give back to society and team up to support the world’s purest and most vulnerable group: children.